A new poll in 35 countries suggests that people around the world would prefer Democratic challenger John Kerry as US president over George W Bush. Global research company GlobeScan Inc and the University of Maryland found clear leads for Mr Kerry among those polled in 30 of the countries. Only Filipino, Polish and Nigerian respondents clearly backed Mr Bush. Most said Mr Bush's foreign policy had made them feel worse about the US since his election in 2000. Meanwhile, a new survey of American and European public attitudes also suggested there had been a dramatic leap in the latter's criticism of US foreign policy. More than three-quarters of Europeans surveyed in 10 countries by the German Marshall Fund of the US said they disapproved of President Bush's international actions, 20% more than two years ago. The survey also showed sharp differences in how governments should respond to potential threats from terrorism and weapons of mass destruction. More than 80% of Americans thought war could achieve justice - more than twice the proportion of Europeans. The GlobeScan/Maryland poll, of 34,330 people, was conducted mainly in July and August. Because of access difficulties, polling was restricted to metropolitan areas in 11 of the countries. "Only one in five want to see Bush re-elected," said Steven Kull, the director of Maryland's Program on International Policy Attitudes (PIPA). 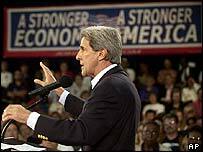 "Though he is not as well known, Kerry would win handily if the people of the world were to elect the US president." Mr Kerry scored best in traditional US allies, such as Canada and Western European countries. The highest margin was in Norway, where 74% of respondents backed Mr Kerry compared with just 7% for Mr Bush. The strongest negative views about US foreign policy appeared to come from Germany, where 83% said their view of the US had got worse. Respondents in all the Latin American countries polled, including neighbours Mexico, also went for the Democrat, with the biggest majority - 57% to 14% - in Brazil. The picture was more mixed in Asia. Only respondents in the Philippines clearly backed Mr Bush, but there was an almost even divide in India and Thailand. Organisers of the poll attributed the Philippine result to US aid to a military campaign against Islamist rebels in the south of the country.